Identification: This species has small, closely spaced tubercles. The stout brown rhinophores usually have flame-like cream markings on their clubs. 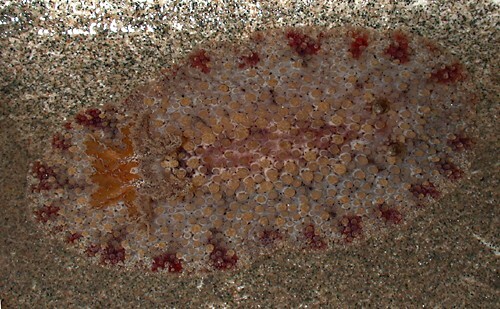 The branchia are two-toned: the anterior gills cream flecked with brown and white, the posterior gills translucent orange-brown. The center of the notum is usually darker and its margin is blotched with brown. The underside is finely flecked with brown. The two-toned branchia and stout rhinophores with cream markings distinguish the species from Carminodoris cf. flammea. Natural history: Carminodoris bifurcata is a moderately rare species found from the low intertidal to 7 m (23 ft) in rocky habitats. It occurs at protected to exposed sites. It lays a cream egg mass that hatches in about six days in the laboratory. Distribution: Big Island, Maui, Lanai(?) and Oahu: widely distributed in the western & central Pacific. Taxonomic notes: This is the species listed as Carminodoris nodulosa (Angas, 1864) in Kay, 1979, Kay & Young, 1969 and Bertsch & Johnson, 1981. It was first reported in Hawaii from Ala Moana, Oahu in Feb., 1962 (Kay & Young, 1969). Photo: CP: 46 mm: Hekili Point, Maui; Nov. 10, 2004.